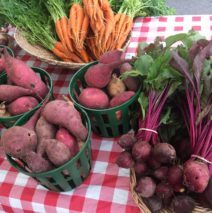 Each week, our farmers and produce vendors want to let their customers know about some of the special, seasonal items that they will have available for purchase on Saturday. These are just a few of the delicious fruits and vegetables that they will have to offer. Aqua Organics: Fresh from the Farm! Organic Lettuces, 3 Varieties of Kale, Rainbow Swiss Chard, Kohlrabi, Radishes, and Everybody’s Favorites–Rainbow Carrots! Want to learn more about all of our amazing produce vendors? Click here.